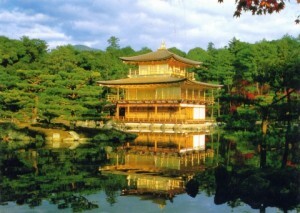 Kinkakuji (金閣寺, Golden Pavilion) , or Golden Pavilion – Zen Buddhism temple in northern Kyoto, the upper floors of which is entirely covered with gold leaf. Formerly known as Rokuondzi, Kinkakuji is one of the main temples of Kyoto. The temple was built at the end of the XIV century and originally served as the residence of the shogun Ashikaga Yoshimitsu. In accordance with the last will of the deceased ruler after the death of Yoshimitsu Kunkakudzi he moved to its own Zen Buddhist school, practicing religious meditation Za-Zen. 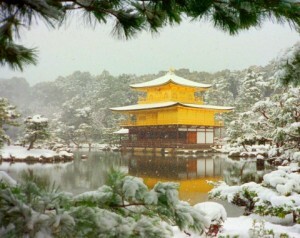 Subsequently, Golden Pavilion has become the main symbol of Kyoto. More than once a fire destroyed the temple almost entirely. The church was completely restored in 1955, and in 1987, further work on the restoration of gold leaf were held in Kinkakudzi. Golden pavilion added to the list of UNESCO World Heritage Site and is considered one of the major historically important buildings of Japan. Golden Pavilion – it is also a vivid example of the aristocratic trends in architecture Kitayama culture prevalent in the 2nd half of XIV – early XV century. Each floor of the building is decorated in a particular style. First floor – in Sinden style of the rich houses and palaces: wooden columns and white plaster walls. Second floor – is the embodiment of style samurai residences, inside there is a statue of the goddess Kannon. The third and fourth floors are decorated in the style of Chinese Zen Buddhism. Garden of the Golden Pavilion is designed in such a way that during the walk to be able to inspect the temple, located in the center, on all sides.